This is an absolutely brilliant idea. 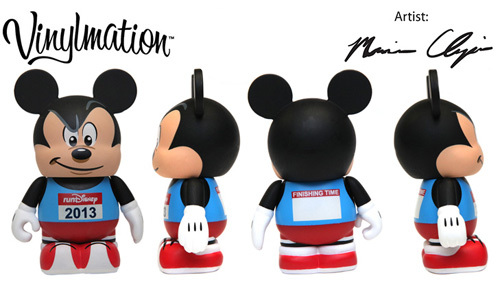 We finally have details on the 2013 Walt Disney World Marathon Weekend Vinylmation. Normally, there is a separate 3″ figure for each race, the Marathon, Half Marathon and Goofy Challenge. This year, they put an interesting twist on things. We knew about the 3″ Run Disney figure that will be released on January 10th at both D-Street Orlando and California. The Disney Collection (former Art of Disney) Blog had recently released a 360 photo of this figure. It is Mickey, all ready to run. Just like previous years, it has a space on the back to write in your finishing time. It is an open edition figure and will retail for $12.95. The Disney Vinylmation Blog also mentioned something about “mini medals” for $1.95. We thought this may be some kind of error; just alluding to Vinylmation that replicate the medals. But NO, MUCH better!!! The Mini Medals are actual accessories you can buy, then hang around your 3″ Run Disney Vinylmation’s neck! As a person who participates in these races and loves to have these keepsakes… I love it! Those will also be released on January 10th. I am speculating the race expo at Wide World of Sports or the Clubhouse store at the complex will carry these. D-Street will have them for sure. Then, in an exciting twist, instead of holding an artist signing at the expo before the race, the signing with artist Maria Clapsis will be held on January 13th, after the WDW Marathon, at D-Street Orlando from 5-7pm. So show up proudly wearing your medal. I may ask her to write my time in as well! Lastly, if you are interested in the WDW Marathon Weekend pins, there are a ton of them this year, including a boxed set to celebrate the 20th anniversary of the marathon. You can hear all about them on the last episode of Once Upon a Pin and check them out at Disney’s official pins page. as an option too. These are fun.